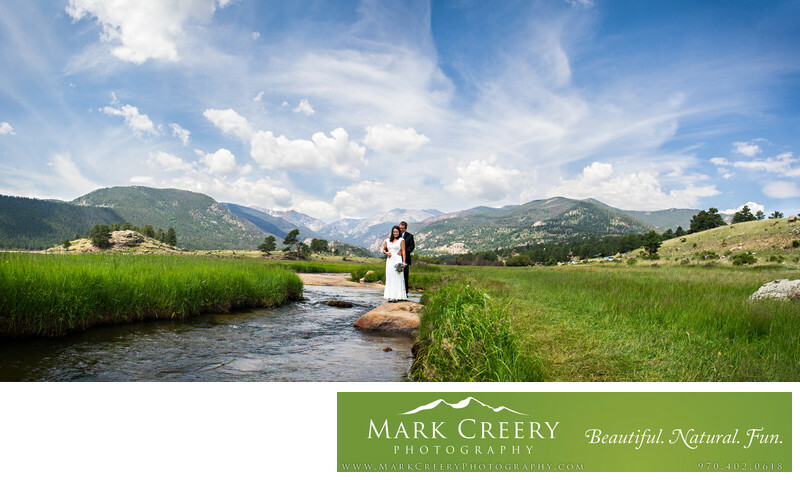 Moraine Park is a beautiful location for bridal portraits in Rocky Mountain National Park. In this photo, the couple stood on a rock along the Big Thompson River, with the mountains in the background and white whispy clouds that contrasted against the deep blue Colorado sky. I created a panoramic photo by taking multiple images and pulling them all together into a seamless high res image. Panoramas are perfect for blowing up large for your wall so you can show off the scenery you chose Colorado for to have your wedding. Moraine Park is located within Rocky Mountain National Park. Location: Moraine Park, Rocky Mountain National Park, Estes Park, CO 80517.